Molly’s teaching style is energetic, powerful and peaceful. 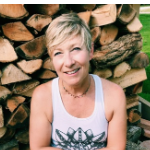 Both her personal practice and her teaching are based on Baptiste Power Yoga which is a physical practice rooted in Hatha yoga and focusing on the individual’s strengths, self-inquiry and finding both physical and emotional growth. In her teaching she focuses on correct and safe alignment while encouraging students to feel the asana (or pose) rather than be concerned with how one looks in the pose. Molly is happy to accommodate students of any level by providing modifications and hands on assists. Currently working toward her 500-hour certification through Asheville Yoga School, her initial teacher training was with Baron Baptiste and Paige Elenson.